JetBlue Airline has issued an official response to the t-shirt incident with Raed Jarrar. Mr.Jarrar was approached by TSA and JetBlue personnel because they saw that customers in the area had noticed his T-shirt and were confused or concerned about it. In that situation, our crew members have the responsibility to create a safe environment as well as safe travel. If there’s anything that upsets or confuses our customers, our crew members have to address them. At the same time, they have to respect the rights of the individual and make sure the individual is treated fairly and respectfully. JetBlue personnel approached Mr. Jarrar and explained that customers were concerned or confused and asked if he could ease the confusion. At no time was he ever denied boarding. He did agree to put another T-shirt on which we purchased for him which we really appreciated. So you see, Mr. Jarrar was not refused boarding. He was just refused boarding while wearing the T-shirt. Is anyone “upset” and “confused” by this? According to Raed’s blog, a representative of the airline asked him to put on a different T-shirt before he was allowed to board the plane. She asked, what kind of t-shirts do you like. Should I get you an “I heart New York” t shirt? I couldn’t find a “We will not be silent shirt” on the web anywhere, so I designed one. Then I started wondering why someone wearing a shirt with Arabic script was automatically assumed to hate New York. So I did another shirt that says “I heart New York.” in Arabic script. When Stephanie Hunter got on the Stanton Island ferry on October 9, she was wearing a “We will not be silent” T-shirt. On October 23, she returned with a group of 100 friends, many of them wearing “We will not be silent” T-shirts. On the morning the Senate passed S. 3930 abolishing habeas corpus and legalizing torture, I called the offices of both Illinois Senators Obama and Durbin to ask how they would vote on the bill. Then I followed up with Emails. The content of the Emails was brief: “Please vote no on detainee torture S. 3930.” and signed my name, ward, and precinct number. I have now received a response from Senator Durbin’s office. I read his Senate speech with great interest, and now I am posting his letter in its entirety. It is worth reading. Thank you for contacting me about our nation’s policies regarding the detention and trial of prisoners at Guantanamo Bay and throughout the world. I appreciate hearing from you on this important issue. Since September 11, Bush Administration officials have bent many of the time-honored rules of warfare regarding the treatment of prisoners. They have claimed the right to seize anyone, including an American citizen in the United States, and hold him indefinitely. They have claimed that Americans and others who were detained have no right to challenge their detention, no right to see the evidence against them, and no right to even know why they are being held. The Justice Department even issued a memo redefining the meaning of torture, stating that abuse only rises to the level of torture if it causes pain equivalent to organ failure or death. The memo concluded that the President had the authority to order the use of torture, even though torture is a crime under U.S. law. This became official Administration policy for over two years before it was withdrawn under public pressure. The Administration also determined that it would deviate from established trial processes and create a new military commission system to try Guantanamo detainees. The Supreme Court rejected this system of military commissions in its June 2006 decision Hamdan v. Rumsfeld because the commission process did not comply with American laws and treaty obligations. In the Hamdan decision, the Supreme Court essentially reminded the President that no one is above the law, even during a time of war. In September 2006, the Administration proposed new legislation to recreate a military commission system and to redefine what interrogation tactics the Administration deemed acceptable. I believed there were two crucial tests for this legislation: First, did it create a process which we would consider fair if it were applied by other countries to American prisoners? And second, was it consistent with our Constitution and America’s fundamental values? The Administration’s bill, the Military Commissions Act of 2006 (S.3930), failed both tests. This bill did not create clear standards for unacceptable treatment of prisoners. It also eliminated the fundamental protection of habeas corpus, meaning that individuals – including legal residents of the United States – could be detained indefinitely without the opportunity to challenge their detention in court. I believe that those who are dangerous to America should be charged, tried and incarcerated, but 200 years of American history have given us clear guidance on how to do this the right way. The drafters of S. 3930 did not heed those historical lessons. I voted against this legislation, but it passed the Senate on September 28, 2006. This Administration has demonstrated that by instilling a climate of fear it can lead a majority in Congress to turn its back on fundamental values we all swear to uphold. I recognize that our enemies in the war on terror have committed atrocities upon American soldiers and others whom they have taken prisoner. I condemn this vile behavior in the strongest terms, and the perpetrators of these atrocities must be found and brought to justice.But in our own detention practices and trial procedures, the United States must hold itself to the same high moral values that we stand for in other circumstances. The war on terror is also a struggle of values and principles, and in order to win it we must convince those who might be swayed by the advocates of terror that the values we Americans hold dear — such as freedom, due process, human dignity, and the rule of law — are values they can embrace as they advance toward a brighter future. Unfortunately, S. 3930 does not represent the values that the United States of America stands for. S. 3930 will be the subject of legal challenges, and it remains to be seen whether the Administration’s new detention, interrogation and commission policies will survive constitutional scrutiny. In the meantime, I will continue to work to ensure that our laws — and the core values upon which they are based – are not laid aside as we act to defend our national security in a time of war. P.S. If you are ever visiting Washington, please feel free to join Senator Obama and me at our weekly constituent coffee. When the Senate is in session, we provide coffee and donuts every Thursday at 8:30 a.m. as we hear what is on the minds of Illinoisans and respond to your questions. We would welcome your participation. Please call my D.C. office for more details. 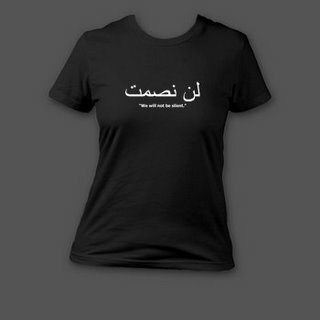 Visit the store for Arabic language T-shirts here. Yes, this is the slogan on the “T-shirt of mass destruction” that got Raed Jarrar kicked off the airplane in New York.